Purchasing a car set for a new child can be a huge financial investment. Parents are wise to choose a convertible car seat that grows with your child keeping them safe and comfortable form infancy all the way until they are kids. The Best 10 Convertible Car Seats of 2018 offer a choice for every budget. Each maker offers a variety of features worth comparing ensuring you pick a car seat that will serve your family for years to come. Extra features like machine washable covers help make parents lives easier. Choosing a car seat that can last for years can be an overwhelming task. Graco is a leader in baby care products and offers a wide variety of car seats that keep your child comfortable and safe. The Extend2Fit car seat works as both a rear facing and front facing seat serving the needs of infants and toddlers. This car seat is suitable for children 4-65 pounds. Parents can select between five different colours allowing them to personalize based on their child. A five-point harness and easy installation work to ensure your child is kept safe in case of a car accident. This is the only car seat you will need for your child. By adjusting the car seat parents can support their young baby while rear facing then adjusts to front facing as a toddler. As kids get older this car seat even offers a seat belt bolster to support them until they reach 100 pounds. The child harness is fully adjustable making it easier to get your child in and out safely. The snap-on cover is a great feature helping parents quickly clean between uses by simply tossing it into the washing machine. 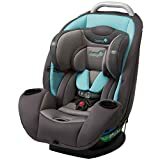 Parents who are looking for an economical car seat that will support their child’s need from newborn to toddler will want to check out this option by Eddie Bauer. Features include an infant insert, easy to use the five-point harness, and a space-saving design. 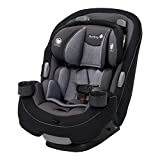 The XRS 65 can safely accommodate children from five to sixty-five pounds and is simple to switch between rear facing to front facing as your child grows. Unlike older model car seats this system utilizes a latch attachment making installation easy and secure. The XRS 65 is slim in design allowing for three car seats to fit easily across the backseat of a car. Designed for the needs of children, the Cosco 2 in 1 Booster supports children from 22-80 pounds. 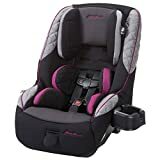 This may be a good option if you have a second child who needs to take the infant car seat leaving your older child to upgrade. Younger children can use the five-point harness and as they age this seat converts to a belt bolster system. An easy to remove machine washable cover helps make cleaning up messes quick and worry-free. Parents and children can choose between two different pinks colors allowing children a way to customize their style. 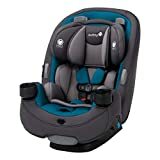 Concerned parents will want to choose this car set the option by Graco is they want to keep their child rear-facing until they are 40 pounds as recommended by the American Academy of Pediatrics. As children grow My Ride 65 LX simply adjusts to front facing until your child reaches 65 pounds. Built-In removable body support helps keep younger children supported. Parents will appreciate the care given to helping them properly install the car seat and ensure their child is not only safe but comfortable. Children can be messy so this car seat offers a removable cover that can simply be tossed in the washing machine between uses. Parents looking for a car seat that will adjust as their child grows will want to consider this car seat by Safety 1st. Adjusting between rear facing for infants to front facing for toddler and children is quick and easy. The QuickFit Harness system allows parents to ensure children are safely buckled with a comfortable headrest position. The Safety 1st Grow and Go Car Seat really is the only car seat children need from birth until 100 pounds. The Coral Blue snap-on cover is a great feature for helping parents quickly clean between uses simply tossing it into the washing machine. Parents with compact cars will appreciate the space-saving design offered by the Guide 65 Car Seat by Safety 1st. 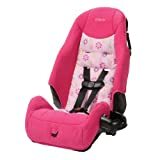 Suitable for both infants up to 22 pounds and toddlers up to 65 pounds this car seat can simply be switched between rear facing to front facing to support growing children. A quick to adjust five point harness and adjustable headrest keep children safe and comfortable. Breathable fabric is easy to clean and keeps children cool and comfortable. Three car seats will fit across the backseat of a standard car making transporting a larger family or friends easy. Safety 1st is a leader in car seta technology offering parents both piece of mind and simplicity when transporting their infant or toddler. 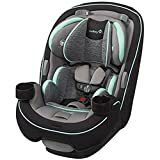 The Grow and Go Car Seat is designed to adjust as your child ages easily moving between rear facing and front facing as well as offering a bolster seat option for older kids. A five-point harness system and side impact resistant plastic ensure that your child is better protected in the unfortunate event of a car accident. The Safety 1st Grow and Go Car Seat is the only car seat your child needs helping save you money. 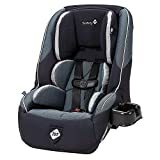 One of the safest car seats currently available, the Ultramax Air Car Seat by Safety 1st features six layers of protection if their patented 360 Protect System. This system combines gel and race car foam to protect children from every direction. Safety 1st also utilizes a QuickFit system in their car seats making it easy for parents to help their child be comfortable with ten different positions. The Safety 1st UltraMax Air Car Seat will adjust to protect infants all the way up to children at 100 pounds. From rear facing to a bolster seta this car seat is the only device you will need to keep your child safer in the car. Are you tired of dealing with poorly designed car seats that are difficult to adjust or hard to switch between cars? The Graco Size4Me car seat aims to make life easier for parents by offering a quick to adjust harness system and a LATCH system for easy installation. Even better is the machine washable cover that can be removed without uninstalling the car seat. Suitable for infants and children up to 65 pounds. As children grow is simple to adjust the car seat from the rear facing and front facing. The harness and headrest are attached making adjustment easy.